I found this Keurig outside the dumpster a few weeks ago. It’s the same model as the one I currently own – also found as trash. I’ll clean it up and donate it to the charity thrift shop, unless one of my friends asks for it first. In the past year or so, I’ve found at least half a dozen K-cup coffee makers sitting on the curb or next to Dumpsters on trash day. All of them turned out to be perfectly functional once I cleaned the hard water buildup from the works. My guess is that they were thrown out because the previous owners didn’t know how to remove the buildup. The water that we drink isn’t pure H20. It usually has trace minerals that are harmless to humans, but can build up in appliances over time and keep them from working properly. Fortunately, it’s easy to remove this buildup. For coffeemakers, run a brewing cycle using a vinegar-and-water solution (and no coffee) every few weeks (more often if you make lots of coffee). Doing this will preserve the life of your coffeemaker and improve the taste of the coffee you brew. 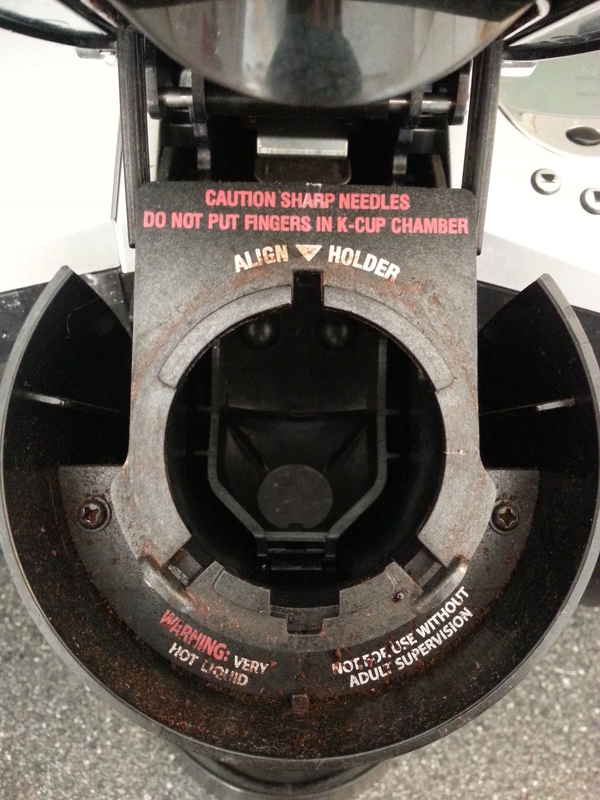 Below are 7 easy steps for cleaning a K-cup machine. Hopefully my blog post will help make a dent in the number of K-cup machines that get thrown away every year. 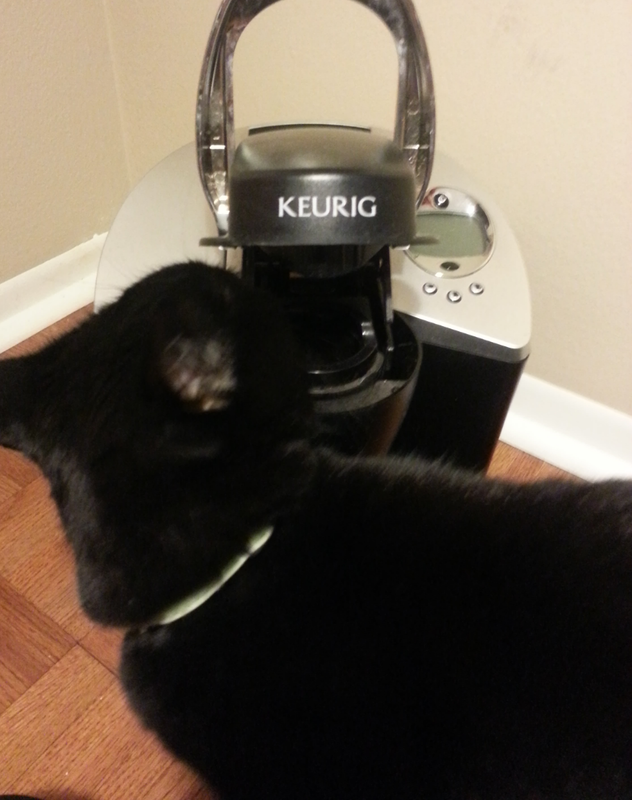 Safety note: Before plugging in any coffee maker you find on the curb, have your cat thoroughly inspect it. Felines are not very good at spotting electrical flaws, but they will insist on evaluating any item you bring into the home, so for the peace of the household you might as well let them. Fill the reservoir with a solution of 1 part distilled white vinegar to 2 parts water (distilled or filtered water are best, if you have them). 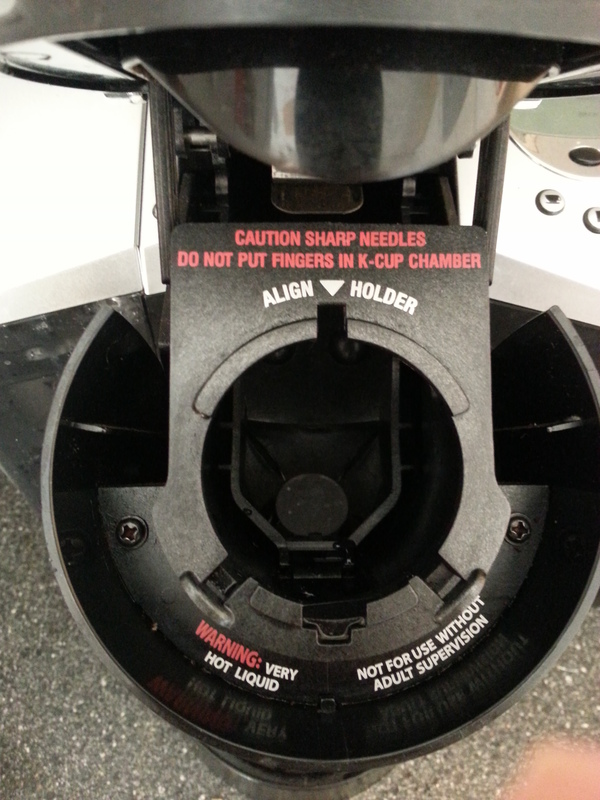 Put an empty mug under the dispenser. I usually use a mug that has coffee or tea stains, because the solution helps remove them. I also put my reusable K-cup filter in the mug so it can get cleaned, as well. Reusable filter soaking in the vinegar-water solution. The speckled pattern toward the bottom of the picture is created by coffee oils on the water’s surface. These oils reflect light. These oils build up on reusable filters and can lead to an off-taste in your coffee if you don’t clean the filter regularly. Turn the machine on. Watch or listen for the water in the reservoir to empty into the heating element of the machine. (The water level in the reservoir will drop.) Keep the machine turned on, but don’t push the “brew” button yet. Let the machine sit for 10-15 minutes. After a few cycles, the reservoir (left) is almost empty. If you have a K-cup machine that holds only one serving’s worth of water in the reservoir and this is the first time you’ve cleaned it, add more vinegar-water solution to the reservoir and run another cycle. Run a total of two or three cycles. If you clean the machine regularly, you can probably get away with just one cycle. Use some of the hot vinegar-water solution to wipe down the filter basket. Fill the reservoir with water (preferably distilled or filtered), and run cycles until the reservoir is empty. Fill the reservoir again and repeat. If you have a small machine, run at least three “rinse” cycles with plain water. Meanwhile, if you have a reusable filter and left it to soak in the vinegar-water solution, remove it and scrub it with a bottle brush. Rinse thoroughly and let dry. Wipe down the outside of the machine with a clean, damp sponge, then wipe dry with a clean dish towel to prevent water spots from forming on the outside of the machine. Enjoy your next cup of coffee. It will taste a lot better now that your machine is clean! Thanks! I was recently given one of these machines and I plan to use vinegar to clean it, instead of that stuff they sell. I use bottled spring water to make my coffee because our tap water kills things quick it's so full of minerals, but I expect I'll need to descale at some point since I'm not using distilled water.